Whisk water, yeast and honey in bowl of stand up mixer until well combined, making sure no honey sticks to bottom of bowl. Add flours and mix on low speed with dough hook until cohesive dough is formed, about 3 minutes. Cover bowl with plastic wrap and let sit at room temperature 30 minutes. Remove plastic wrap and evenly sprinkle salt over dough. Knead on low speed (speed 2 on Kitchen Aid) 5 minutes. Increase speed to medium and continue to knead until dough is smooth and slightly tacky, about 1 minute. If dough is very sticky, add 1-2 Tablespoons flour and continue mixing 1 minute. Fold dough over itself; rotate bowl quarter turn and fold again. Rotate bowl again and fold once more. Cover with plastic wrap and let rise 30 minutes. 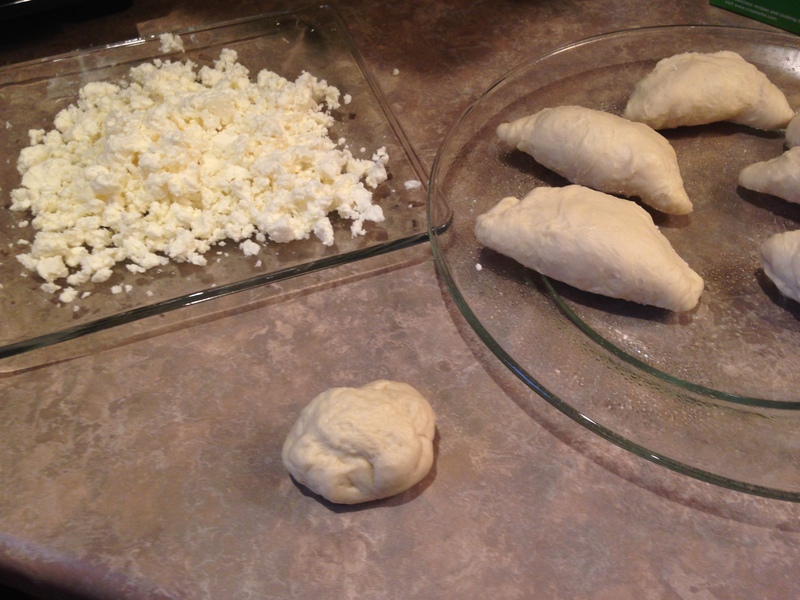 Repeat folding, replace plastic wrap, and let dough rise until doubled in volume, 30 minutes will be enough time. Spray two 9 inch round cake pans with nonstick cooking spray and set aside. Transfer dough to floured work surface, sprinkle top with more flour. Using bench scraper or knife, cut dough in half and gently stretch into 16 inch cylinders. (Or cut in half and make 2 small loaves.). If making rolls, divide each cylinder into quarters, then each quarter into 2 pieces. You should have 16 pieces total. Dust top of each piece with more flour. With floured hands, gently pick up each piece and roll in palms to coat with flour, shaking off excess and place in prepared pan. Arrange 8 dough pieces in each cake pan, placing one piece in middle and others around it, with long side of each piece running from center of pan to edge and making sure cut side faces up. Loosely cover cake pans with plastic wrap and let rolls rise until doubled in size, about 30 minutes. 30 minutes before baking, adjust racks to middle position and heat oven to 500 degrees. You have to pay attention and set your timer so you keep on task. It is well worth the effort. Whether you make the rolls or loaves of bread you will be happy you spent that time wisely. Simple and Delicious! Martin suggested making something with cream cheese and raspberries. Sounded like a great combo to me. In a medium bowl, add flour, baking powder, baking soda and salt. Whisk together and set aside. Bake at 350 for 25 minutes or until wooden pick inserted into center comes out clean. Remove from oven, let cool 5 minutes than take muffins out of tin. Cool on wire rack. 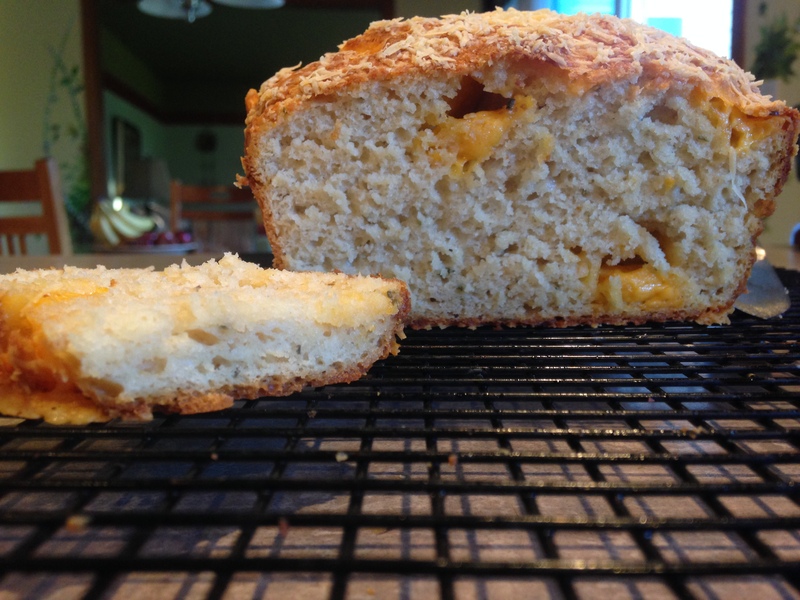 I follow King Arthur Flour and saw this recipe. I am on a cupcake/muffin kick so I thought I would give them a try. Very easy to make. Very delicious to eat. Preheat oven 425 degrees. Lightly grease muffin tin or line with paper liners. In a medium sized mixing bowl, cream together the butter, oil and sugars. Add eggs and whisk until combined. Using wooden spoon or spatula, stir in baking powder, baking soda, nutmeg, salt and vanilla. Stir flour into the mixture alternately with the milk until all is combined. Spoon the batter evenly into the muffin cups,filling until nearly full. Bake the muffins for 15-17 minutes or until they are a pale golden brown. Remove from the oven and let them cool a few minutes. While they are cooling melt the butter for the topping. I did that in the microwave. Brush the tops of the muffins with the melted butter. Dip and roll the tops of the muffins in the cinnamon sugar. Serve warm, or cool and wrap airtight. Store for a day or two at room temperature. 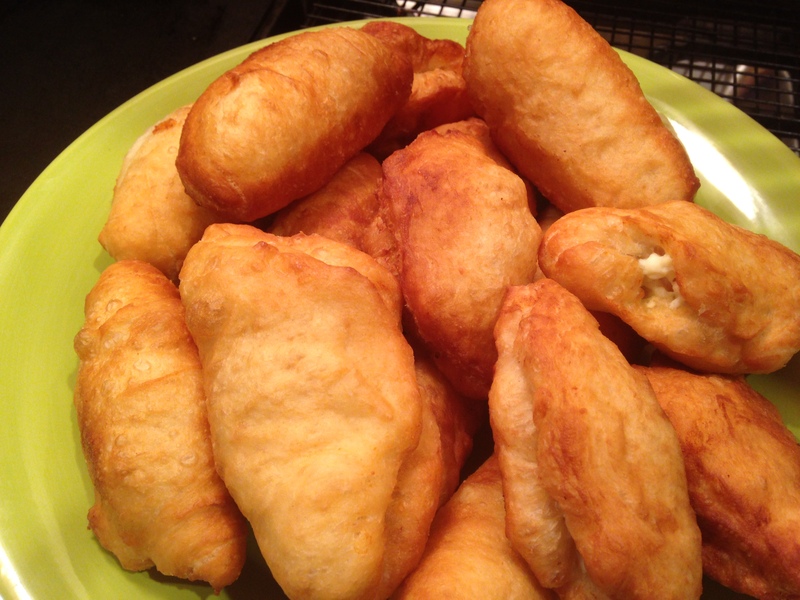 I ended up making another Pitka on Saturday. I played around with the ingredients a bit. This one turned out tasty too. Very similar to soda bread. Preheat oven to 350 degrees. Grease and flour baking pan. I used my cast iron skillet for my first attempt. That was a good choice. After mixed together form a round, flat bread. (approx 9″ round, 2-3″ height) Place in prepared baking pan. Brush top with egg whites. After mixed together form a round, flat bread. (approx 9″ round, 2-3″ height) Place in prepared baking pan. Take out of oven. While warm, wrap in towel. When cooled place in plastic bag to store. When making Pitka for Christmas Eve the Bulgarian tradition is you put a coin and positive notes (“good health”, “happiness”, etc.) in the Pitka. I cleaned off a quarter and wrapped that in foil. I put notes on parchment paper and folded and placed in the Pitka. We enjoyed both breads. However, Martin missed the egg white brushed on top of Pitka 2. We did end up eating the entire Pitka 2. Like I previously mentioned Pitka 1 was not baked all the way through. Too chewy. I will post number 3 after New Year’s. Wishing us all a peaceful 2016. My New Year’s wish; Let there be peace on this earth please! Let us all break bread together!! I make Mekitsa quite often. I originally posted this recipe in 2011. I have noticed I get quite a few hits for this recipe. I pulled it up today and realized that my original draft was difficult to understand. I am hoping my revisions will make it easier to follow my recipe and enjoy the end result. Martin enjoys Mekitsa stuffed with feta cheese. He is the one who always asks for these so I make them to his preference. However, if you sprinkle with confectioners sugar or cinnamon and sugar they are quite delicious too. Martin is from Sofia, Bulgaria. He moved to Green Bay when he was 11. I try to make some of his favorite foods that he enjoyed when he lived there with his grandparents. Food can bring back the best memories, wouldn’t you agree?? I know when my house smells like garlic it brings back many holidays spent at my grandparents in Syracuse NY. You would enter their home into the kitchen. You would immediately be hit with the aroma of that anticipated delicious meal. Great memories!! 1. Start the yeast in the warm water and set in a warm place for 10 minutes. 2. In a separate bowl add yogurt and baking soda, stir together (this will bubble) and set aside. 1. Place 3 cups of flour in your food processor bowl. 2. Add the rest of the ingredients and mix together until a ball forms. It takes about 30 seconds to 1 minute. Remove from food processor. Make into a ball. 3. Place dough in lightly oiled bowl. Let rise 60 minutes. Ready for frying!! 1 Place flour in a bowl. 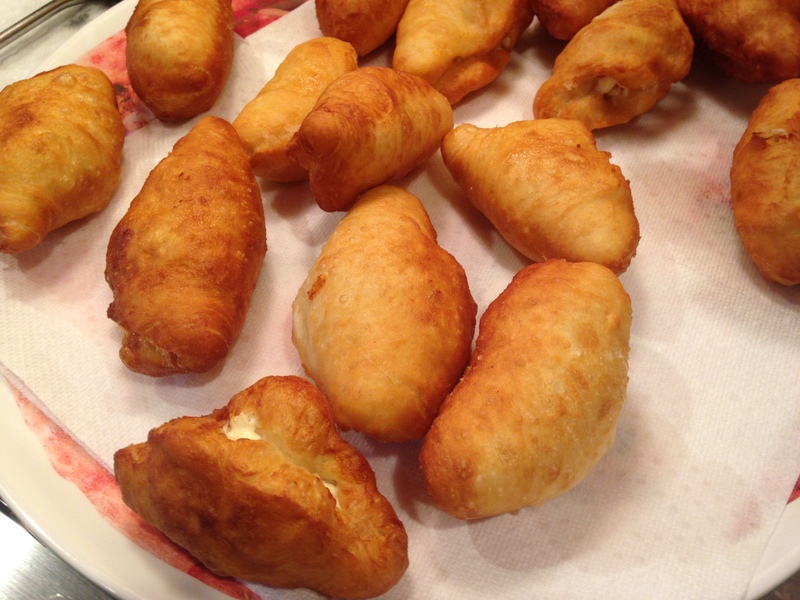 Make a well in center of the flour and add the yogurt, yeast mixture, oil, vinegar, sugar and salt. Using a wooden spoon, mix well to form a soft dough. 2. Turn out onto a clean, unfloured surface and lightly knead for about 10 minutes. Put in a glass bowl and let rise for 1 hour. 3. They are ready to fry or transfer to plastic bag and refrigerate for 1/2 day or overnight. If you refrigerate and make later, take out of the fridge about 30 minutes before you are going to fry. That will get the dough to room temperature. 1. Heat peanut (or vegetable) oil. 2. Cut off a golf ball size piece of dough and with moist hands pull the dough into a flat disk about 3-4 inches in diameter. (The shape can be irregular, no need for a perfect circle). 3. Fry in oil being sure to turn the dough when the first side is brown. When both sides are brown, remove from oil and place on a paper towel. 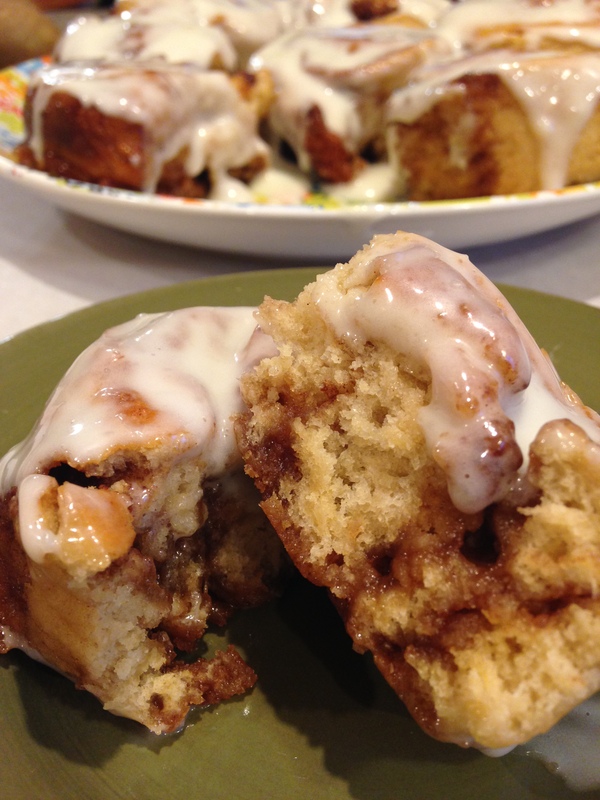 For a sweet treat, when cool sprinkle with cinnamon & sugar or powdered sugar. 4. For a savory treat, I most always stuff with feta cheese. 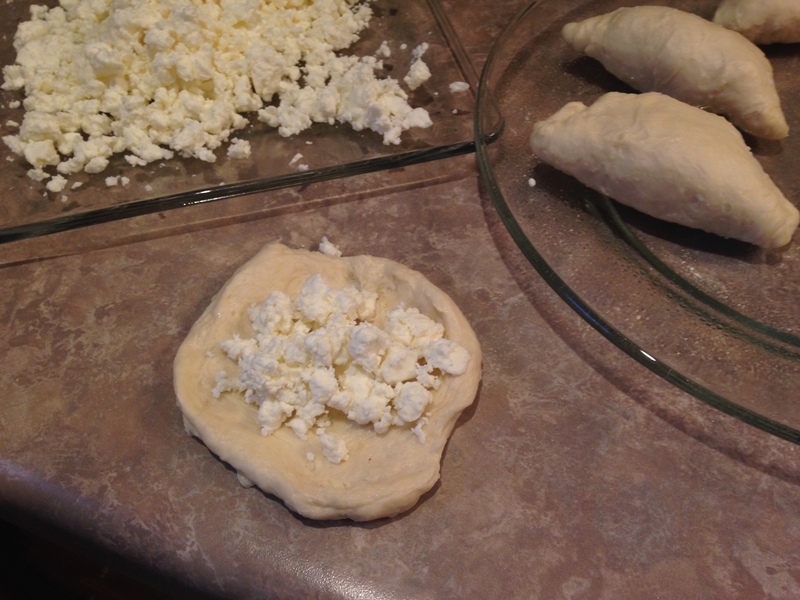 To do this you make the disk, put crumbled feta cheese in the middle, fold over and fry in peanut oil. Get one side brown, the flip over and brown other side. 5. Place on paper towel to drain. Watch it when you eat these as the cheese can be very hot in the middle. Let them cool a little bit before taking that first bite! Sweet or Savory, these are a delicious treat! Fall is in the air. Time to bake some bread. Here is a recipe I found in an America’s Test Kitchen magazine a long time ago. We add rosemary and it makes a great complimentary flavor. Everyone enjoys this simple and delicious bread! 1. Adjust oven rack to middle position and preheat oven to 350 degrees. Spray 8 1/2 x 4 1/2 inch loaf pan with vegetable oil spray. Sprinkle 1/2 cup Parmesan cheese evenly in bottom of pan. 2. In large bowl, whisk flour, baking powder, salt, cayenne, and pepper to combine. Using rubber spatula, stir in cheddar, breaking up clumps, until cheese is coated with flour. 3. In medium bowl, whisk together milk, sour cream, butter, and egg. Using rubber spatula, gently fold milk mixture into flour mixture until just combined (batter will be heavy and thick, don’t overmix). 4. Scrape batter in prepared pan; spread to sides of pan and level surface with rubber spatula. Sprinkle remaining 1/2 cup Parmesan evenly over surface. 5. Bake until bread is deep golden brown and toothpick inserted in center comes out clean, 45-50 minutes. Let bread cool in pan on wired rack for 5 minutes. 6. Remove bread from pan and let cool to room temperature. Take a spatula and go around the pan before removing. It will release out of bread pan without any problems. Let cool about and serve. I make these buns a few times a year. I got the recipe from Cooks Country magazine. I first posted this recipe in 2012, then again in 2013. I made these last week and brought them into work. The ladies loved them. I thought it would be nice to post the recipe again and move it up on my feed for my coworkers (and others) to bake these Simple and Delicious buns! Combine sugars, cinnamon, cloves and salt in small bowl. Add melted butter and stir with fork until mixture resembles wet sand, set aside. Preheat oven to 425 degrees. Brush 9 inch nonstick square or circular cake pan with 1 Tablespoon butter. 1. Whisk flour, sugar, baking powder, baking soda, and salt together in large bowl. 2. Whisk buttermilk and 2 Tablespoons melted butter together in small bowl. 3. Add liquid to dry ingredients and stir with wooden spoon until liquid is absorbed. 4. Transfer dough to lightly floured counter and knead until smooth. Next, pat the dough with hands into a 12 by 9 inch rectangle. 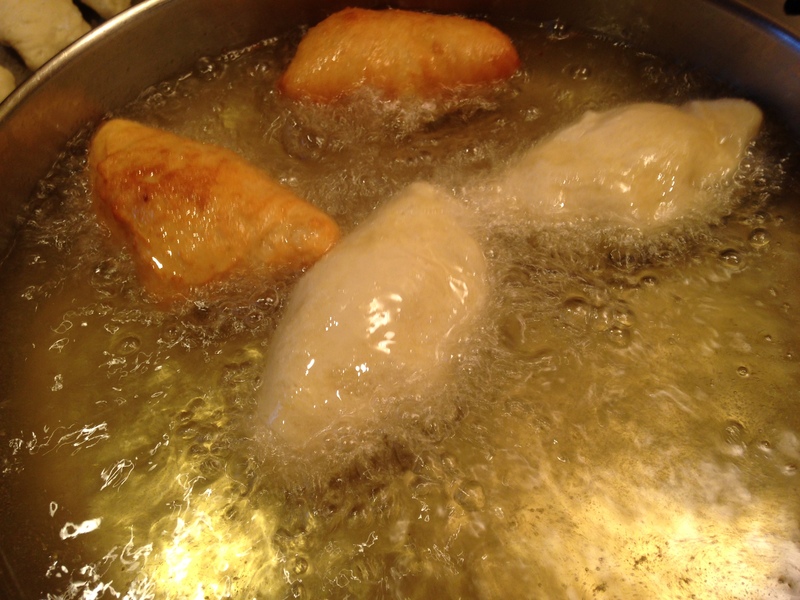 Brush dough with 2 Tablespoons melted butter. 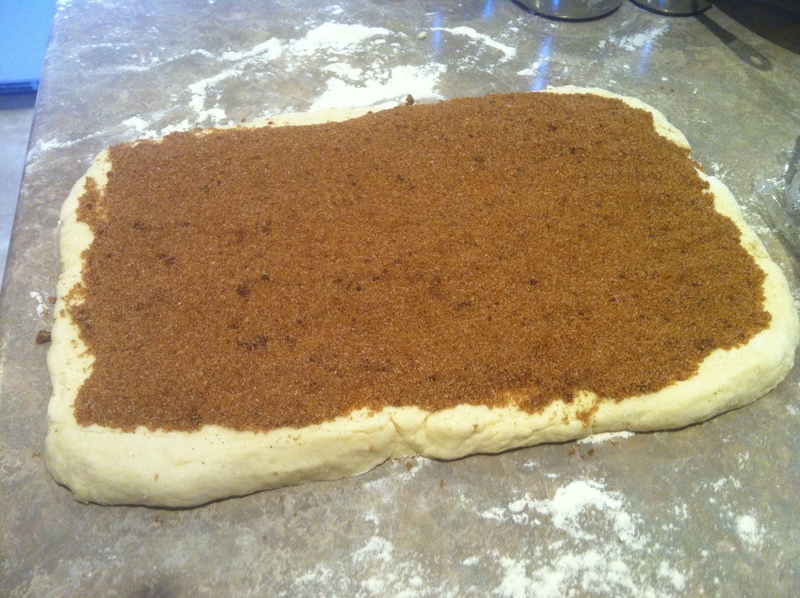 Sprinkle evenly with filling, leaving 1/2 inch border around edges of dough. Press filling into dough. Loosen dough from counter. 5. Starting at long side, roll dough, pressing lightly, into a tight log. Pinch seam to seal. 6. Roll log seam side down and cut into 8 equal pieces. 7. Place 1 roll in center of prepared pan and place remaining rolls around perimeter of pan. Brush with remaining 2 Tablespoons of butter. 8. Bake until edges are golden brown, 23-25 minutes. Use spatula to loosen buns from pan and place on wire rack to cool. After 5 minutes of cooling, start icing! 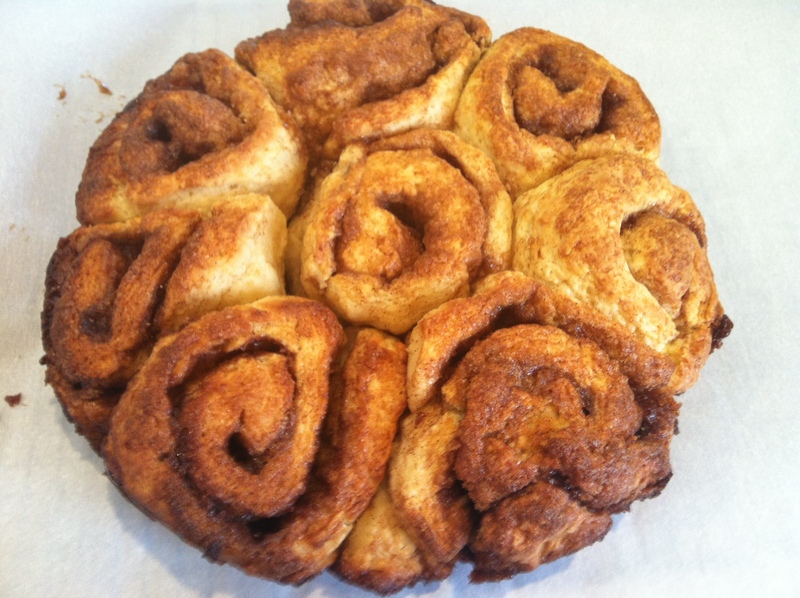 While buns cool, line rimmed baking sheet with parchment paper, set rack with buns over sheet. Whisk cream cheese and buttermilk together in a non metal bowl until thick and smooth (mixture will look like cottage cheese at first-and it really does). Sift confectioners sugar over (sometimes I sift, sometimes I don’t); whisk until smooth glaze forms, about 30 seconds. Spoon glaze evenly over buns and serve immediately. This may seem like it takes forever but it really doesn’t and these buns are AWESOME!! NOTE: I ended up making 2 batches Thursday night. One for us and one for work. I prepared them the night before and placed in the refrigerator overnight. I took a pan out in the morning for work and when I got home from work I baked the other pan for our Breakfast Friday. When you take out the overnight pan, let it set on counter to get to room temperature (about 45 minutes) and then bake as instructed. I made the icing while they were baking. Another Simple and Delicious adventure in my kitchen. ENJOY! !